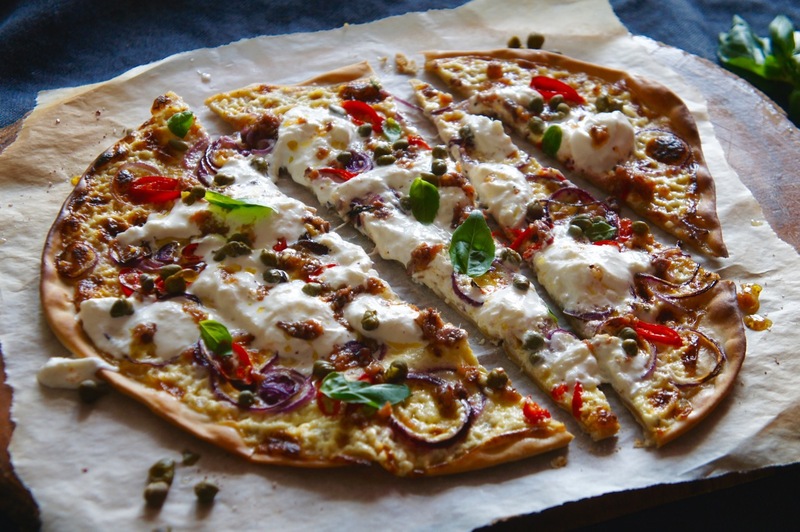 If you’re wondering what a flammkuchen is, it’s basically a heartily topped Alsatian and South German flatbread (and can also be known as a tarte flambée*). It’s not a pizza, and doesn’t have any tomato sauce or a squidgy crust, but it is essentially bread dough with toppings, so I see why you might make a comparison. It’s very thin with crispy bits, but then also soft and a bit doughy in the middle where the sauce is – the most magnificent combination. I have started seeing them around in Amsterdam and it’s a brilliant drinks accompaniment. Flavour: check, carbness: check, texture: check, sharing ability: nailed. 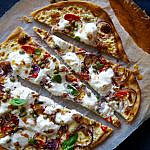 It’s also very quick to make (quicker than pizza for sure if you’re still hanging onto that comparison) and you can easily make it suitable for meat lovers and vegetarians alike. *Having been embarrassingly reprimanded for calling it a German dish by a French friend, I have of course updated my description! 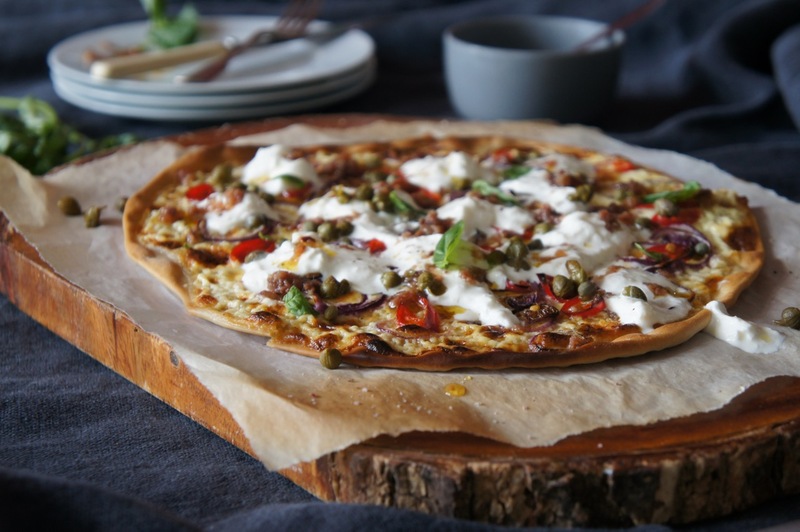 The traditional flammkuchen combination is a seasoned, creamy base topped with onions (which was have here as well) and lardons. This is wonderful, however, I decided to go for a slightly different recipe, with a little more complexity. My recipe has a beautifully rich and creamy flavour from the base and especially the burrata*, cut through by tangy capers and the most wonderful, salty anchovy oil. If you don’t like anchovies, stop being silly and try it anyway – it’s not overly fishy and it has a complex and unbelievably delicious rich, salty flavour that makes the recipe. If you reaaaally won’t have anchovy oil (or you are a veggie), then some garlic or chilli oil would be an alternative option. This recipe also works wonderfully with spelt flour if you have that lying around. *I’m new to burrata and think it is heavenly. If you’re not familiar with it, it’s a rich, creamy, gooey mozzarella – so indulgent and so perfect. Preheat your oven to 250 degrees C.
1. Dough: Mix the flour, water, oil and salt in a mixer with a dough hook, or with your hands, to form a rough dough. Once mixed, use your hands to knead the dough lightly until smooth – don’t over-knead. Divide the dough in two. 2. Base: Finely slice your onion into rings. Mix the sour cream, double cream and garlic clove, then season with salt and pepper to taste. Thinly roll out your two pieces of dough into ovals or a rectangles. Spread half the cream mixture over each base, leaving about 1 1/2 cm space at the edge. You will have quite a thick layer but that’s fine. Top with the thinly sliced onion rings and the chilli slices (as many or as few as you wish). 3. Oven: Bake the flammkuchen in the hot oven for 10 – 15 minutes, until the edges are starting to crisp and the cream mixture has bubbled. 4. Anchovy oil: Whilst your flammkuchen are in the oven, make your anchovy oil. Finely chop 6 anchovy fillets and crush or finely chop your garlic clove. Mix the garlic, anchovy fillets, chilli flakes and 2 tbsp olive oil in a small bowl, smushing the anchovy filets as you mix. 5. Toppings: When the flammkuchen are out of the oven, prepare your toppings. 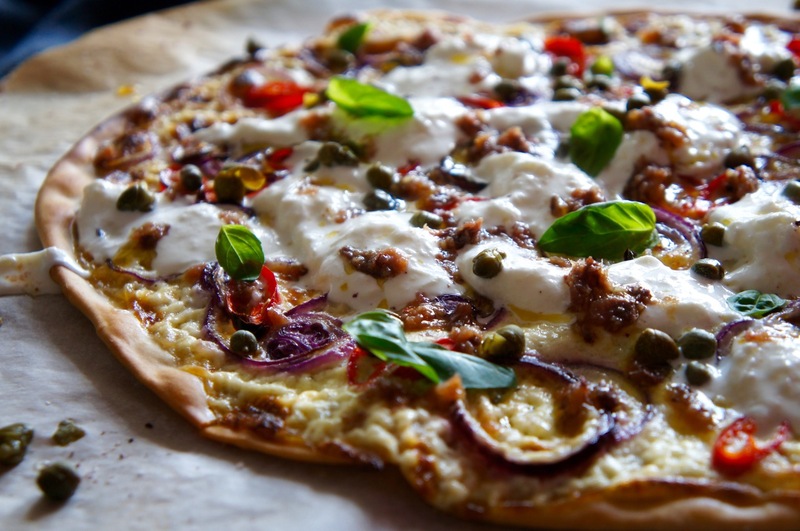 Carefully halve the burrata and divide it between the two flatbreads, blobbing it evenly around the base. 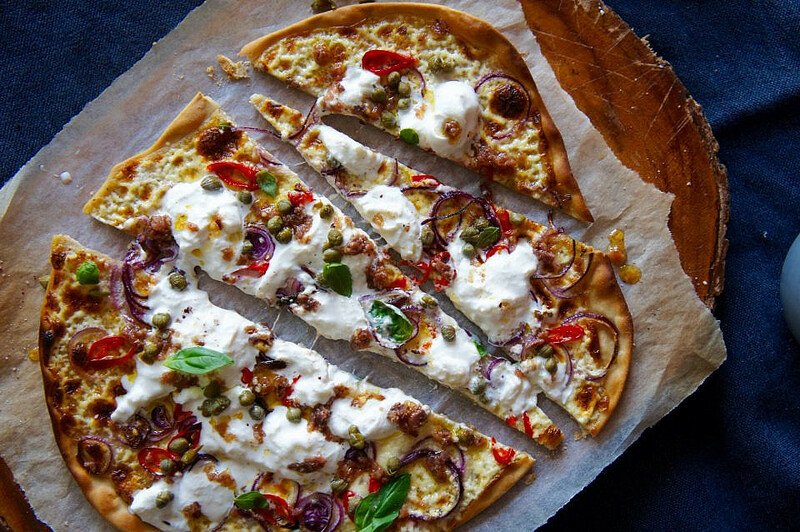 Drizzle the anchovy oil over the flammkuchen and top with capers and little basil leaves. Delish.